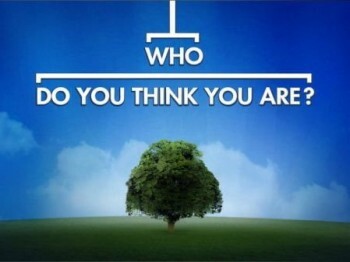 Last night I watched Who Do You Think You Are? with Christina Applegate following her grandmother in hopes of giving some peace to her father. If you missed Episode 2 you can tune in next Tuesday on TCL as they, in partnership with Ancestry.com , present Episode 3. In the next episode, Chelsea Handler unearths Nazi roots in Germany. The series is powerful this year with some gritty stories emerging. I like that so far they are focusing on one ancestor and really digging into records such as newspapers, court records and census records to add details to the ancestor. Last night's episode was very moving. I don't want to spoil it for those who have not yet watched so all I will say is that Christina's father never knew his mother, not even her name. He was raised by his paternal grandmother until age 14 when he went to live with his father. You will not want to miss this episode and the unsettling truths that are revealed. But in the end there is closure for her dad. Watching this last night brought to mind my discovery of my father's gravesite 50 years after he died. I was the only one in the family who knew what cemetery he was in, but the cemetery had told me he was in potter's field with no marker and they had no way of knowing exactly where he was. I lived with that sadness for 44 years and then a very kind man found the record showing the exact location of Dad's ashes. I was told I could add a simple marker, but I decided he should be with his family so had him re-interred in his home town where his parents, brothers, grandparents and great-grandparents are buried. A small plaque with his name and dates of birth and death was added to the existing marker where he now rests. It was not possible to bury him with his mother or father so I opted to place him with my mother and her parents. I cannot describe the immense feeling of closure I felt when that marker was put on the base of the existing stone. I visit as often as I can and leave a memento to show Dad I was there. It took 50 years but my dad now rests with his family and family members can visit his grave. It took Christina's dad 70 years to find his mother and I'm so happy that he did. Labels: Ancestry.com, Burial Records, Cemetery, Christina Applegate, Court Records, Newspapers, TLC, WDYTYA, Who Do You Think You Are? Old Reader is going private in the next two weeks. So if you switched to Old Reader as your solution to Google Reader being canned, you need to find another one. Here are the details on Old Reader Blog as to why and when they are closing Old Reader to the public "Desperate Times Call For Desperate Measures"
NewsBlur.com: Right now they are not accepting free accounts. I tried to sign up this morning and there are 2100 people waiting ahead of me for a free account. For $24.00 a year you can get a premium account immediately. 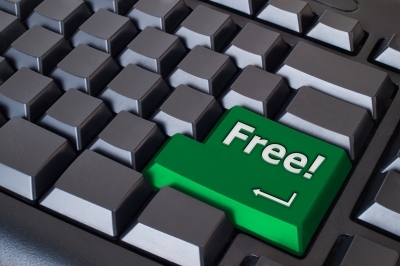 Free accounts have a cap of 64 sites. I may try this one as the demo looked like it would do what I want. Feedly.com: This is pretty popular and it synched Google Reader feeds seamlessly before Google Reader was canned. I'm on Feedly but have to admit I'm looking for a replacement. 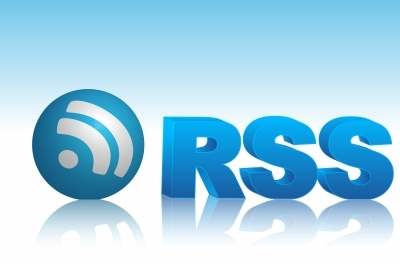 It is the most popular of RSS Readers but it just doesn't suit my needs. Pulse: I use Pulse on my iPad and I really like it. It's more visually oriented than most readers but for iPad use I like that. IronReader: This RSS Reader is getting some good press. I haven't tried it so can't comment but you may want to check it out. My good friend (and cousin through our shared Van Slyke ancestors) Thomas MacEntee, creator of GeneaBloggers and High-Definition Genealogy has a new website up and running! Hack Genealogy is a new resource for the genealogy industry and the growing community of genealogy and family history enthusiasts. Hack Genealogy is about “repurposing today's technology for tomorrow's genealogy” and a little bit more. Hack Genealogy is more than just a list of resources: It provides information on emerging technology inside and outside the genealogy industry. You can follow Hack Genealogy on Facebook (http://www.facebook.com/HackGenealogy), Twitter (http://www.twitter.com/hackgenealogy) and at http://hackgenealogy.com. Many researchers ask me where and how they can find information about an early Upper Canada (aka Canada West aka Ontario) ancestor and where he or she settled. Early Ontario records can be challenging to find. Ontario was not settled until the American Revolution when many Loyalists fled the Colonies (later the United States of America) for Canada.Very early records were often not taken or if taken, have not survived. But there are land records, it's just a matter of knowing what has survived and where a collection can be searched. It is also important to know the boundary and name changes that occurred in Ontario. From Upper Canada to Canada West to Ontario, you will need to know what years the name changes took place. Also important are the District and County name changes. Here is a complete list of the District Names in 1846 and the counties and townships in each. Below is a list I compiled of online searchable land records. There are many that are not online and I have also provided a link to my website where a list of offline resources is given. I hope this is of help to struggling genealogists. * Upper Canada Land Petitions index and images online on Library and Archives Canada (LAC). * Canadian County Atlas Digital Project at McGill University. The County Atlas Digital Project is a searchable database of property owners' names which appear on the township maps in the county atlases. 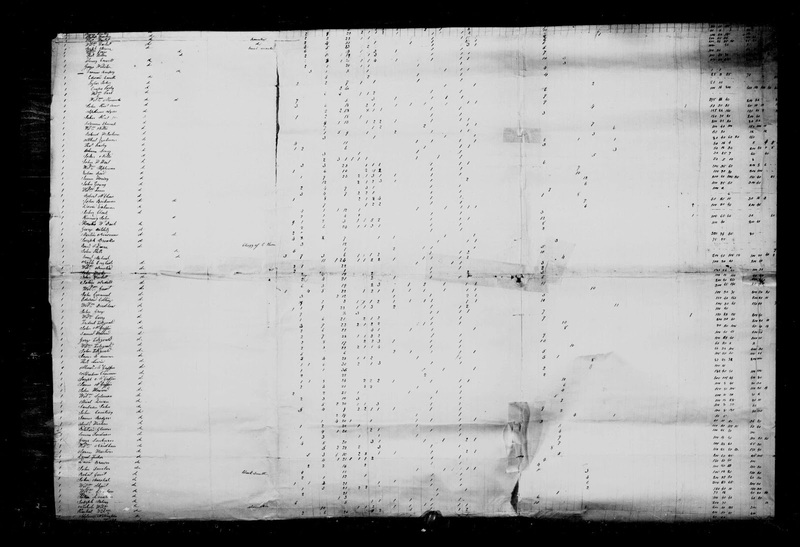 Township maps, portraits and properties have been scanned, with links from the property owners' names in the database. Joey wrote to Olive Tree Genealogy asking for help with a WW1 dog tag he found in Wheaton Missouri. On one side the inscription reads ORL then what could be an F or an E then a T. KELLY under that there is a 116. So we know that the soldier's name was T. Kelly, his rank was ORL (I have not yet found what that represents) and his unit was the 116. The number on the reverse is his longer personal military number. 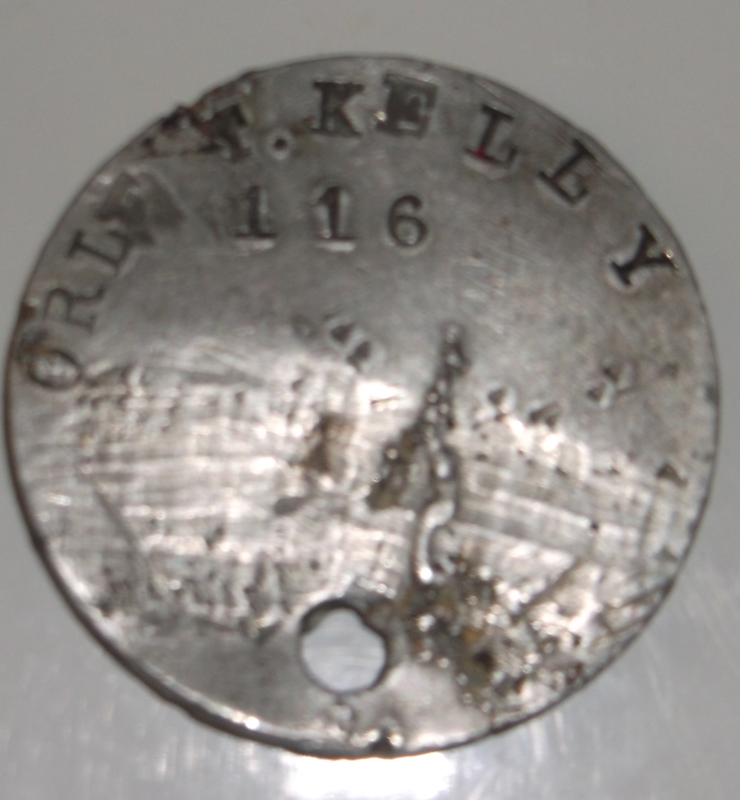 My husband and I think that could be a stamp or insignia between ORL and T. Kelly and not a letter. We also think it is an American soldier's dog tag. But just to cover all bases, I had a look in the Canadian Expeditionary Force (CEF) online database because it is searchable by the soldier's number but there is no T. Kelly with a number starting with 14472. I then searched U.K. WW1 records on Ancestry.com because they are also searchable by soldier number but that was a miss. Unfortunately the American WW1 soldier draft records on Ancestry.com are not searchable by the soldier's number. I did find a Jonathan Ernest Kelly living in Wheaton Missouri at the time of his enlistment but could not spot a T. Kelly. So we need my wonderful readers to pitch in and help find the soldier who lost this dog tag. You've solved 13 cases of the 17 posted previous to T. Kelly so I have no doubts you can work your genealogy sleuthing magic again! Please either post your findings here as a comment or send them to me privately at olivetreegenealogy AT gmail DOT com Remember to not put any information about living individuals in your comments, any contact addresses or phone numbers for descendants of T. Kelly should be sent in private email. It's great that LAC is bringing revised versions of these early census records online but... what is happening to the promised 1921 census that was released on June 1st this year? Where is it? What stage is it at in digitizing? Why is LAC putting up a wall of silence and secrecy? Sgt. Dominick Licari was one of 9 children born to Italian immigrants Sam and Mary Licari. In 1942 at the age of 29 he was drafted. In March 1944 the plane he was in crashed into a mountainside in Papua-New Guinea . Sgt. Licari and others on the plane were declared missing and presumed dead. While the wreckage of the plane was later found, no remains were spotted until 2012 when bone fragments were unearthed at the crash site. DNA samples provided by his brother August "Mort" Licari matched that of Sgt. Dominick Licari, who was 31 when he went missing. His remains and dog tag are being returned to family. 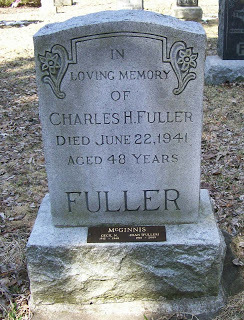 After military declared him deceased in 1946, his family erected a grave marker with his name on it at the family plot in Frankfort New York. It is there he will be buried alongside his parents and other siblings. Ancestry.co.uk has made its entire 1911 Census FREE* for a limited time. That gives you the chance to discover your family's stories during one of the most fascinating periods in British history. 1911 came right at the end of the old 'upstairs-downstairs' class system, just before World War I. This was the year the Titanic was built, and the height of the campaign for women's voting rights. Simply type in an ancestor's name to find out what they were doing at this crucial time. Make sure you view the original record, and see if you can spot any servants, soldiers or suffragettes in your family. *The England & Wales 1911 Census will be available to search for free from 00:00 BST on 24th July 2013 until 23:59 BST on 14th October 2013. To view these records you will need to register for free with Ancestry.co.uk with your name and email address. Last night I watched Who Do You Think You Are? as Kelly Clarkson followed the trail of her ancestor Isaiah Rose. I'd already seen it when I downloaded it from iTunes for free but wanted to watch it again. I thoroughly enjoyed Episode 1 and liked Kelly's enthusiasm. She seemed completely natural and for me there was no feeling of "this is all rehearsed" (even though I'm quite sure there is a script of sorts). If you miss an episode you may be able to watch it the next day on TLC depending on what country you live in. For example Episode 1 is available for viewing now but not for me in Canada. TLC tells me I must visit discovery.ca to watch videos but of course Who Do You Think You Are? is not one of those offered to Canadians. What surprised me this morning was to see some criticism on Faceboook. One genealogist mentioned that he/she didn't believe that Kelly's mother had no clue that her 2nd great grandfather was a Senator. I was flabbergasted! Things happen in families - sons become estranged from fathers, daughters run off and elope and are disowned (as happened with my own great-grandmother).... When that happens, there is often no mention ever again of the grandparent or parent. So why would this be difficult to believe? We have no clue what events transpired in the Rose family. In my own family, my father knew nothing of his paternal grandfather and never met him. In fact he didn't know that the man was alive until my dad was in his late 20s! My grandfather and great-grandfather were estranged and didn't speak or see each other for the rest of their lives. So great-grandpa was never spoken of. As for my father's maternal grandparents, he knew very little because his grandmother had run off with his grandfather against her parents' wishes. They disowned her and never spoke to her again. So she never spoke of them. And we must also remember that "back then" children were seen and not heard, and adults tended to whisper in corners about things that did not, in their minds, concern children. 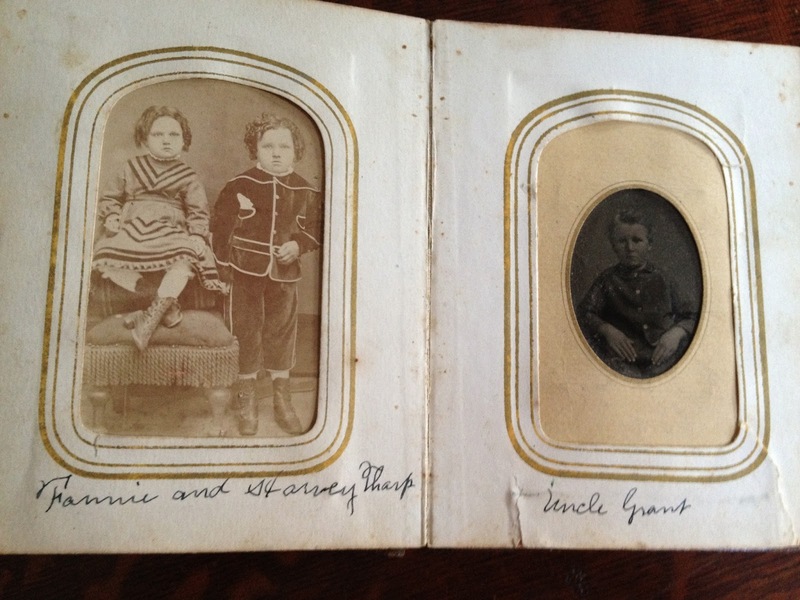 So often a child grew up knowing very little about family and ancestors. 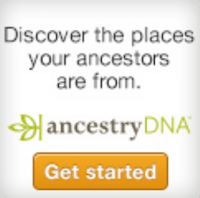 Labels: Ancestry.com, The Learning Channel, TLC, WDYTYA, Who Do You Think You Are? FamilySearch has recently added more than 4.4 million index records and images from Brazil, Czech Republic, and the United States. Notable collection updates include the 3,651,739 images from the new Brazil, Pernambuco, Civil Registration, 1804–2013, collection, the 408,573 images from the new Brazil, São Paulo, Immigration Cards, 1902–1980, collection, and the 205,349 index records from the new United States Social Security Death Index collection . What a Story I Have to Share! Today I became the very excited owner of the coffin plate of my 2nd great grandfather, Isaac Vollick. 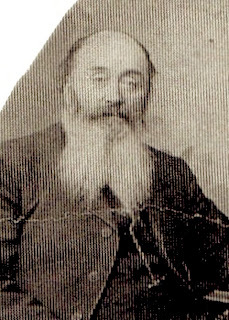 Isaac was born in 1832 in what was then Upper Canada (present day Ontario) and he died in 1904 in Hillsdale, Simcoe Co. Ontario. I've never found his gravestone or burial site, nor his wife's even though I know what cemetery they are in. I hear you asking "ok what's a coffin plate and why is this a great story?" Coffin plates were decorative adornments attached to the coffin that contain free genealogical information like the name and death date of the deceased. After the funeral service, these plates were often given to family to take home as a memorial to the deceased. 1. Last week I realized I could not log into my website AllCensusRecords.com as I did not remember my password. No amount of searching found it so I did the usual thing - hit the "I forgot my password" link on my webhost. No problem, they email a new temporary password. But I wasn't sure what email address I had used to sign up on this host. 2. After checking my main email addresses with no luck (no response from the web host) I realized my account must be under a very old email address I haven't used in years. I rarely check mail there even though I do still have access. But off I went and yep, the password was there. But what was even more interesting was an email, months old, from Gary French, the author of "Men of Colour: An Historical Account of the Black Settlement on Wilberforce. 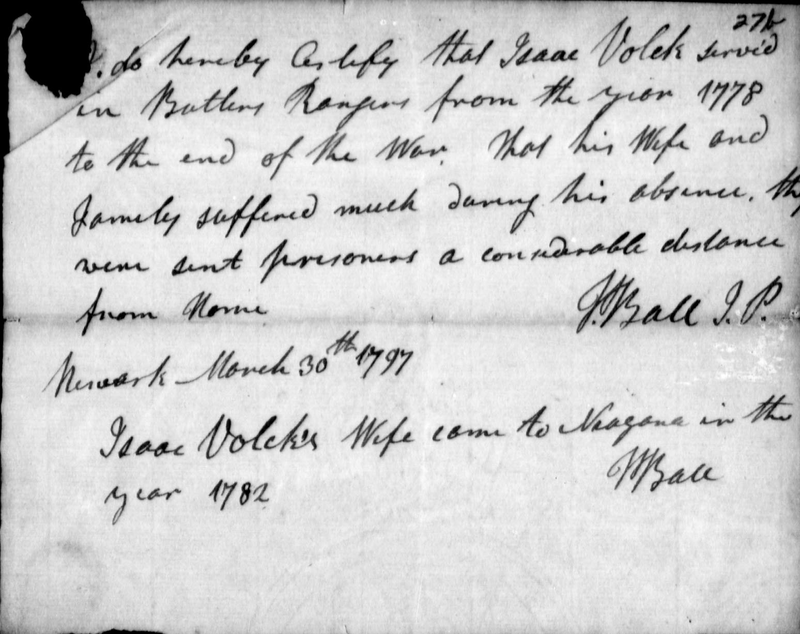 Street and in Oro Township, Simcoe County, Ontario 1819-1949"
Gary was writing to me about my husband's black ancestor, Jonathan Butler, who settled in the Queen's Bush (near Waterloo Ontario) circa 1834. It seems Gary had found some evidence that pointed to Jonathan being originally from Pennsylvania. This was a very exciting lead as we had not been able to find any record of where in the USA he came from. So I quickly replied to Gary's email, hoping he was still interested and still at the same email addy. 3. 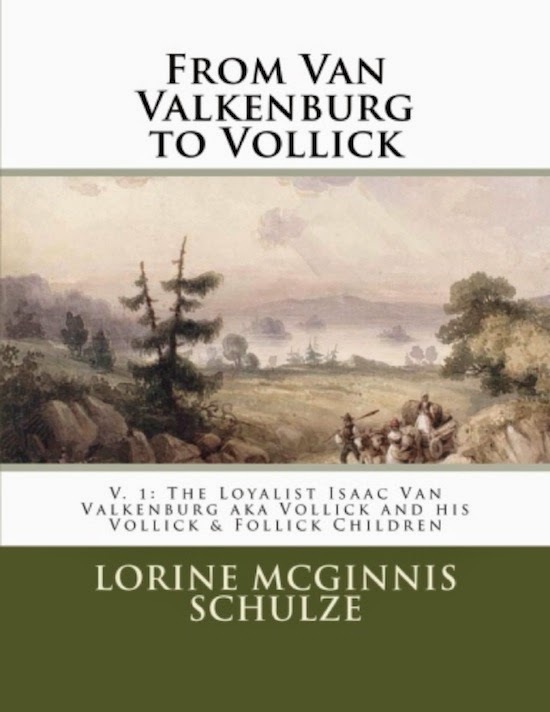 After a few emails back and forth, I casually mentioned in closing that I thought we had a "sort of" connection, as I knew that a son in his French family married a daughter of one of my Vollick family in Elmvale. When Gary wrote back I almost fell off my chair. This is what he said ".. 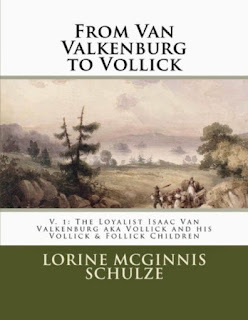 I am interested in them [the Vollicks] as important settlers in the Elmvale/Orr Lake area. 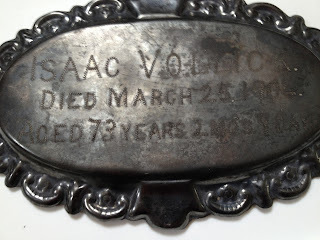 By coincidence, I recently purchased the coffin plate of Isaac Vollick (the one who died in 1904). macabre, but a very Victorian artifact." I was so excited. Not only was this MY Isaac Vollick (my great great grandpa) but my husband and I collect coffin plates! We have over 200 in our collection and my husband has put many of them online on AncestorsAtRest in hopes descendants will spot an ancestor. 4. Immediately I responded, telling Gary about our own coffin plate collection and how the coffin plate he had was for my 2nd great grandfather. Then I asked Gary to consider selling the plate to me IF and WHEN he ever decided he no longer wanted it. 5. Gary agreed to sell it to me since I had such a strong family connection, even though he does not sell the items he finds which have some connection to Flos Township in Simcoe County. One of his missions is to find and preserve as many historical artifacts as he can for this local area. And so this morning hubby and I drove to Gary's office and the coffin plate was turned over to me to preserve and cherish. But the story does not end there. 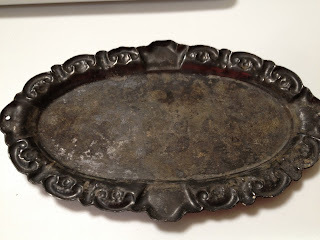 I asked Gary where he found the coffin plate and his reply gave me shivers! 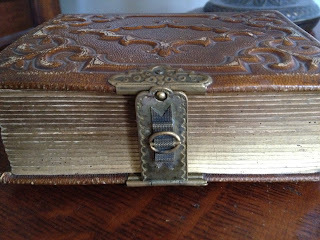 He found it in an antique store in Barrie - one which my husband and I go to frequently. The plate had been turned upside down (see photo on right) and was being sold as a tray! For some reason Gary picked it up and turned it over. To his surprise he realized it was actually a coffin plate for a Vollick! Since he recognized the surname and knew they settled in Elmvale he purchased it to add to his collection of historical artifacts for the area. And that is how I came to be the very happy and grateful owner of my great-great-grandfather's coffin plate. No doubt his widow Lydia carried it home with her and after her death most likely one of her daughters took it to her home. And so, 104 years later, the coffin plate has come to me. I will have it framed along with a photo I have of Isaac and Lydia, then in turn it will eventually go to one of my sons. And that is what I call serendipity and an item wanting to be found. Update to Case #17 Harold Western CEF WW1 Dog Tags Found in France. Thanks to the generous efforts of my readers and in particular Bruce G., this case has been solved and a great deal of information found about Harold. Bruce was able to find a nephew of Harold Western's who in turn gave us the name and contact information of Harold's grandson who lives right here in Ontario. Coincidentally I had found reference to Harold (and one of my Peer relatives!) in the Guelph Mercury, along with a photo which you can see on the left. Harold was one of the enthusiasts in the 1910 Thanksgiving Day Road Races. 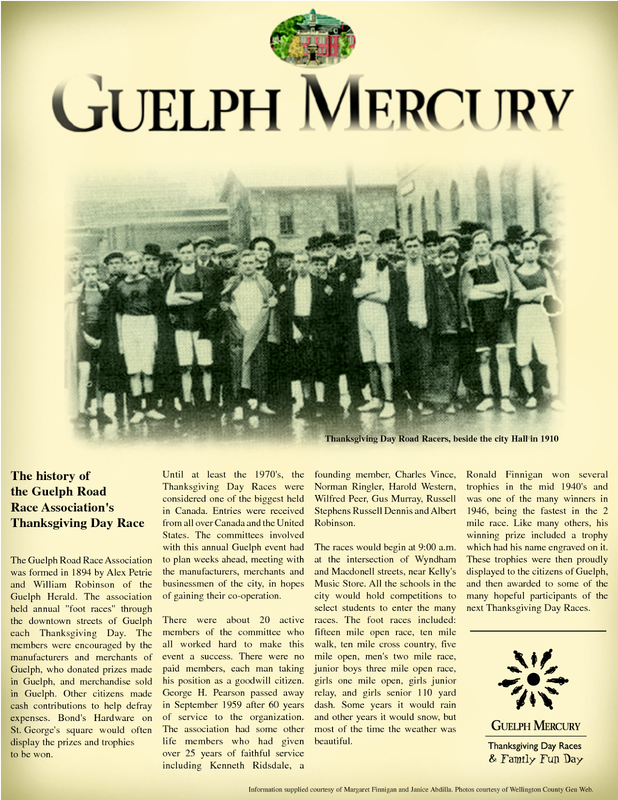 He was an early member of the Thanksgiving Day Road Racers Assocation. Luck was with me as I also found the obituary of Harold's son Bill. Harold married Dorothea Coreen Caroth (?) between 1926 and 1935.
died 29 Mar 1935 at Guelph. refereed into his senior years. Bruce also sent the earlier research he did on Harold's ancestors so we can fill in many details. I've passed all the information on to Michel who is the man who found Harold Western's Dog ID tags in France. Great news from LAC (Library and Archives Canada) about new census records online. No, it's not the much anticipated 1921 census of Canada but it's still good news. Library and Archives Canada is pleased to announce that Canadians can now access the Census of Canada West, 1842 as well as the Census of Canada East, 1842 online. In 1841, Upper Canada was renamed Canada West, and Lower Canada became Canada East. These two jurisdictions are now known as the provinces of Ontario and Quebec. Each census is partly nominal and contains the names of heads of family, their occupation and the number of residents for each family. 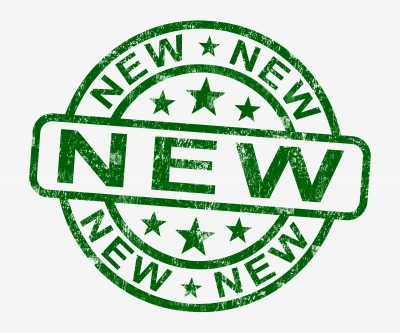 Users can search these new databases by the names of heads of family, as well as by geographical information such as district and sub-district names. Enumerators visited 17 census districts, divided into sub-districts. These units were made up of cities, towns, parishes, villages and townships. Not all returns have survived. The returns for eight districts and 51 sub-districts have been preserved and are searchable online. 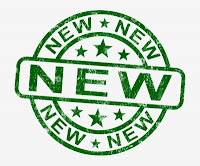 (PROVO, Utah) – July 18, 2013 –Ancestry.com the world’s largest online family history resource, has added more than 220 million historical New England records to its existing databases, creating the most comprehensive collection of New England records available online. Included in the new collections are birth, marriage and death records for hundreds of millions of residents in Massachusetts, Connecticut, Maine, New Hampshire, Rhode Island and Vermont, as well as images, diaries and articles from Colonial times to the 1980s. “Many Americans have roots in New England, and with the addition of these records to our site, Ancestry.com offers an unprecedented amount of information for those who want to search and discover their New England history,” said Daniel Jones, Vice President of Content for Ancestry.com. Over the past few months, Ancestry.com has spent more than 10,000 hours digitizing and indexing historical records from the region in order to make them easily accessible online. The new records reveal countless facts of people from the region, from population to job growth, while also bringing insights into the life of notable New Englanders. Battle of the Sexes – If you were looking for Mr. or Mrs. Right in the 1850s, you may have had better luck moving to a neighboring state. In Vermont during the 1850s, men outnumbered women by more than 35,000. Just over the border in Massachusetts, women actually outnumbered men by 68,000. Role of Technology in Transforming Jobs – New England has always been a hub for the latest technology. In the 1850s, the top tech jobs included cotton and wool mill workers, as well as shoe makers. By the 1940s, being a machinist meant you had the hot New England tech career. During that period, the number of farmers in New England declined by 66 percent, proving technology was the future. The new collections are not only a treasure trove of information for those trying to learn more about their family origins, but also those interested in learning more about notable New Englanders throughout history. Norman Rockwell’s indexed death record and Benjamin Franklin’s birth record are included in the new collections, along with Ralph Waldo Emerson’s obituary and even a record of Dr. Seuss’ birth (Theodor Geisel). 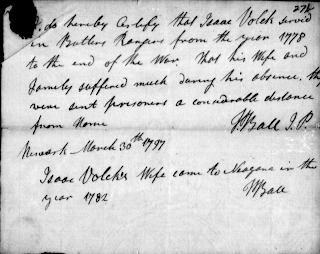 The new collections also contain unique subject matter such as original letters regarding the Salem Witch trials. The new collections also reveal that the nation’s Founding Fathers left a lasting impression in many New England families. From 1850-1940 more than 500 people were named after John Adams, compared to 37 named after George Washington. From July 18-21st, Ancestry.com will make all of these impactful records from the New England Historic Genealogical Society – along with several other New England record sets – available free of charge for the public to search. This will enable beginner and expert family historians alike to explore curiosities and research their New England heritage. I saw this online yesterday and am so intrigued by it that I had to share with my readers. This is a story of "The House That Time Forgot"
When I say they left it as it was in 1932, this includes food in the kitchen pantry, original appliances from the 1920s, all their dad's coats and hats still hung on pegs in the hall, and so on. So a little piece of a historical era has been frozen. As intriguing and interesting as it is, I find it a tad creepy. Don't get me wrong! I love antiques, in fact our home is filled with them and visitors often remark that it is like entering a museum with so much to look at in our home. And of course I am all for preserving family memories (which these brothers did - perhaps too well?) For me it seems as if the boys (and their mother) were unable to move on after the dad's death. So they too were stuck in time, perhaps never fully grieving his passing. And I think that's very sad. What do you think? Amazing and a wonderful tribute or just a wee bit disturbing? 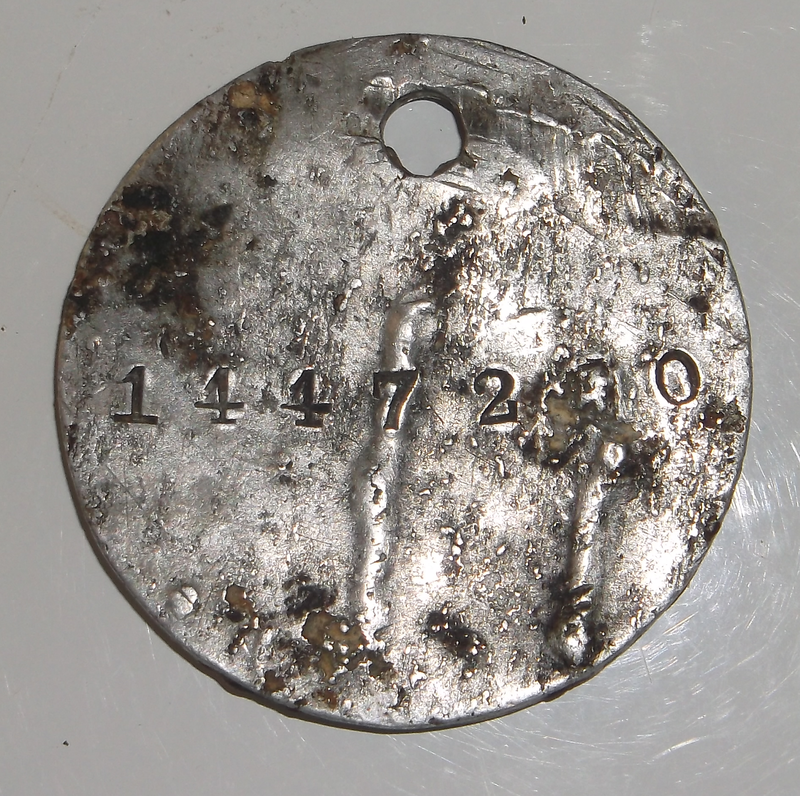 Michel, who lives in France, wrote to Olive Tree Genealogy about a WW1 soldier's dog tag he found at Eecke. It is near the France-Belgium border. With the Number 402989 seen on the ID tag, Michel found the attestation papers for Harold Western. He was in 10th Bn. of the CEF (Canadian Expeditionary Force). From his attestation papers online on Ancestry.com and Library and Archives Canada, we know that Harold was born 12 June 1893 in Yorkshire England. 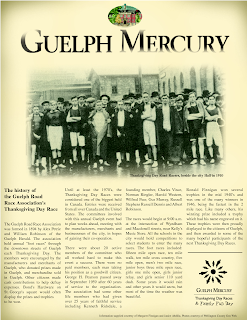 He was living in Guelph, Wellington County Ontario with his father William Western. Harold enlisted in March 1915 in Guelph. Michel would like our help in finding out what happened to Harold and did he have descendants or other family. Can you help find Harold? Of our previous 16 cases of Lost and Found Soldier's dog tags in both USA and Canada we have solved 12 and all dog tags have gone home to family! Please take a peek at our four cases that are still open and hopeful of being solved with soldiers' dog tags sent home. Good news! The new season of Who Do You Think You Are starts on July 23, 2013 on The Learning Channel. Episode 1 with Kelly Clarkson is available for download FREE on iTunes. I watched it yesterday and it's very compelling. Kelly searches for details on her Civil War ancestor Isiah Rose. What she finds moves her to tears. Labels: Free Downloads, iTunes, Kelly Clarkson, WDYTYA, Who Do You Think You Are? Olive Tree Genealogy Makes it to TV Again! Imagine my surprise when CBC (Canadian Broadcasting Company) contacted me yesterday afternoon for my opinion on a story they were working on about 6 generations alive in Toronto. They wanted to come up from Toronto to film me but realized I lived too far away for them to drive up, film me, drive back and get the tape edited before the news. They asked if I was by any chance coming down to Toronto that day but that was out of the question so we settled on doing a Skype video interview which they would record. It was a very intriguing story since 6 generations living is pretty rare. I've only encountered two 5-generation living, one being my own daughter-in-law whose great grandmother is still alive, and never a 6 generation even though I've been a genealogist for over 40 years. When you think about it, having 6 generations living with the oldest member only 86 (as in this family) means each mother had to be about 17 when she had her child. And the general rule of thumb in genealogy research is 25 years for each generation. Even taking 20 years as the generational rule of thumb means that even if the oldest person was 100 you would only have a 4 or 5 generation line living. Anyway the interview was fun and I guess I offered something worthwhile as I didn't end up completely cut and on the editing room floor! They kept a few seconds of my interview. Here is the story online called 6 generations of same family living in Ontario and here is a link to the video clip which aired on The National on CBC last night. I appear about halfway through the video and yes, it's fun to be on TV but unsettling at the same time! Oh and in case some of my readers are wondering about the use of the word "again" in the title of this blog post, I've been on CBC news previously when I helped research a soldier whose WW 1 letters were found in an attic in a Toronto home. See Olive Tree Genealogy CBC Interview Segment Tonight! Olive Tree Genealogy received a request from a reader (Hillary M.) of my AskOliveTree blog. 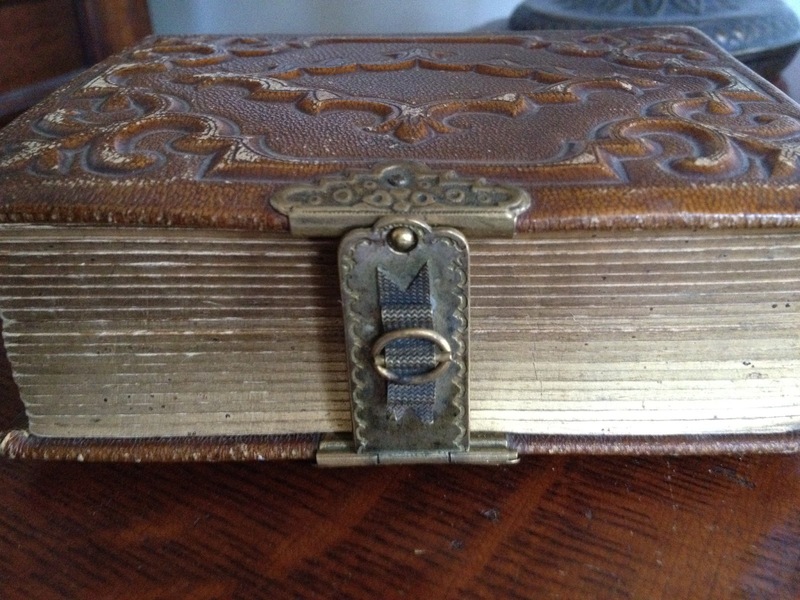 I am very pleased to share with my readers that the orphaned Kirby photo album I found and rescued from an antique store has arrived safe and sound in England. Gordon Wake, the descendant who I contacted after finding his Family Tree on Ancestry.com , was thrilled to receive the photos. Postal mail from Canada to England didn't take that long and Gordon and his wife wasted no time once the package arrived. Gordon tells me he is overjoyed to finally see a photo of his grandfather! 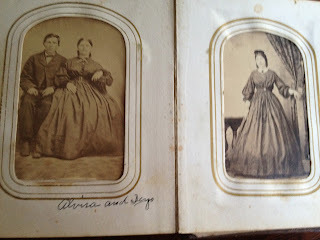 And I am equally pleased that these photos have now found a new home to be treasured and shared with other descendants. Even as I write this blog post, Gordon is happily scanning the photos to share with two descendants here in Canada. I also included in the package several pages of the hand-written notes I made while my husband and I studied and analyzed clues in each photo. Gordon requested I send those as they might help him to identify more of the individuals who appear in the photos. This was such a happy ending story for me and I was privileged to be part of it! I'm so glad I didn't pass that album by which I admit I almost did as it was rather expensive. But I kept returning to it in the store and I knew I had to have it. 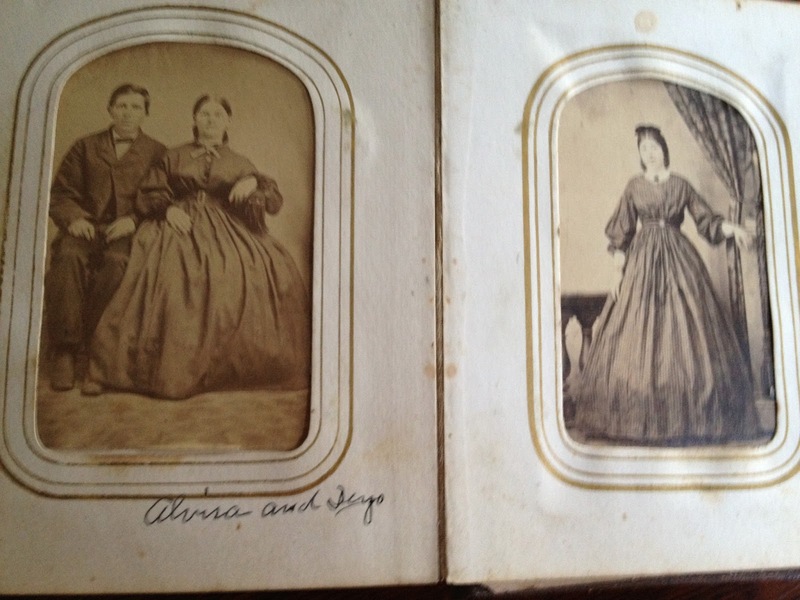 Another Civil War Photo Album has been rescued. That's right, I couldn't pass this one by. Almost every page in the album has writing which identifies who is in each photo. 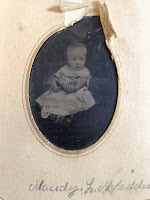 There are 38 photos, either tintypes or CDVs (Cartes de Visite) and they are from the early 1860s to about 1890. The album is in good shape but the pages are stained. 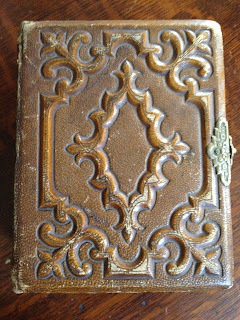 The photographs are also in decent shape which is surprising considering the rough life I think this photo album had. I will be documenting and archiving the photographs over the next few months but here are a few of the camera photos I took as my first step. For those who haven't followed me before when I rescue and preserve these old albums, my first step is always to photograph each album page with the photos intact. 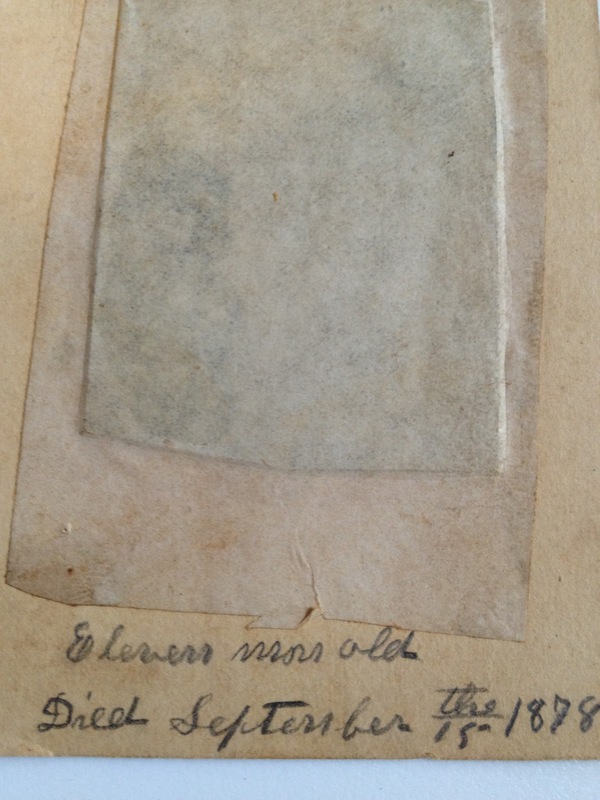 Only after that is completed do I attempt to carefully remove the photographs to see what is on the back and to scan them properly. This was one of the few photos (a tintype) that did not have writing on the album page itself. Instead it had a penciled name "Mandy (or Maudy) L. McFadden" on the front. 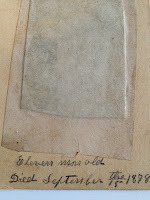 On the back (verso) it had a sad note "Eleven mos old. Died September 15th 1878"
This is an example of the inside photo album pages and the gorgeous Civil War era photos inside! The surnames I have spotted already are Chidester, McKay, Deyo, Tharp, Strong, McFadden, Duncan, Bush, Perry, Pittenger. The locations of photographers are Iowa, Indiana and Nebraska. I will continue to update with scans and details of individuals as I remove the photos from the album and as I spend some time researching the names. Those interested will be able to follow along by clicking on the tag "Chidester Photo Album Archive" in the right hand nav bar on this blog. Genealogy Roadshow Coming to PBS this September!